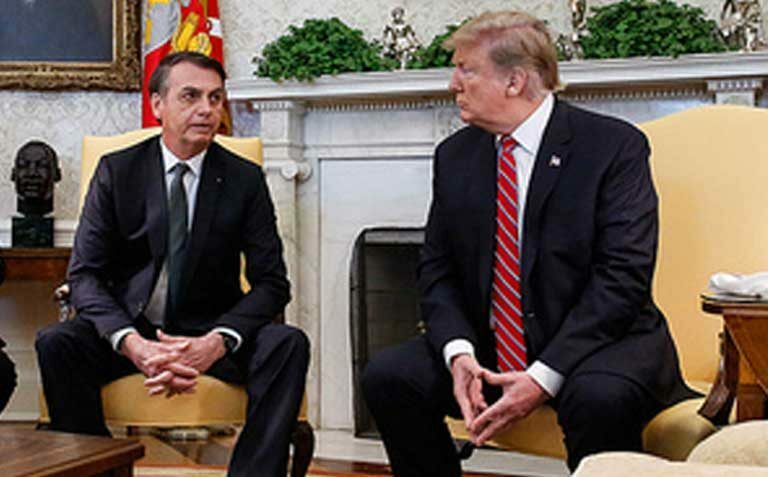 On his first trip outside Brazil to meet with a head of state, Jair Bolsonaro met with Donald Trump at the White House this week. Bolsonaro also visited the CIA and dined with Trump former strategist Steve Bannon, believed to have had a role in helping Bolsonaro get elected. Bolsonaro and Trump are known to have discussed trade, but their meeting was conducted in secret. Bolsonaro, dubbed the “Trump of the Tropics,” has long expressed his interest in stronger U.S. relations, though Brazil’s agriculture minister is also courting China (U.S./China trade relations remain frosty, and Brazil hopes to sell more of its soy to the Asian nation). In a speech at the U.S. Chamber of Commerce, Bolsonaro stated that the Brazilian government wants more agreements with the United States in a number of areas, especially mining and agriculture. He added that there is much to be discovered in the Amazon, a likely reference to untapped resources and agribusiness possibilities there. During the visit, a letter of intent was signed between the U.S. Agency for International Development (USAID) and the Ministry of the Environment (MMA) “to work toward the launch of the first-ever biodiversity-focused impact-investment fund for the Brazilian Amazon,” with the US$100 million fund to be financed largely by the private sector. Brazil President Jair Bolsonaro answers questions from the press during his meeting with U.S. President Donald Trump. Image by Isac Nóbrega / Presidency of the Republic. President Jair Bolsonaro’s trip to the United States — beginning last Sunday and ending Tuesday — is an effort at political and commercial rapprochement between the two countries, an attempt in sympathy with the policies of President Donald Trump. In his first international trip to meet with another head of state since taking office, Bolsonaro was accompanied by seven ministers, including Agriculture Minister Tereza Cristina, and his son Eduardo Bolsonaro, who recently took the chair of the Foreign Relations Committee in the House of Deputies. Environment Minister Ricardo Salles did not travel with the group, but instead attended a United Nations event in Kenya last week. During and since his election campaign, Bolsonaro has expressed a strong desire to be closer to the current American administration. In an interview with Fox News on Tuesday, Bolsonaro — introduced by the conservative network as the “Trump of the Tropics” — spoke of his admiration for the American president and supported his restrictive immigration policies, including the construction of the wall along the Mexican border, which among its many problems is expected to do significant harm to border biodiversity and habitat interconnectivity, if built. President Bolsonaro speaks at an event at the U.S. Chamber of Commerce. Image by Alan Santos / Presidency of the Republic. On Monday Bolsonaro attended an event at the U.S. Chamber of Commerce sponsored by transnational companies. In his speech there, he stated that the Brazilian government wants to sign more agreements with the United States in a number of areas, especially mining and agriculture. He added that there is much to be discovered in the Amazon, a reference to untapped resources and agricultural possibilities there. The president signed a Technological Safeguards Agreement (TSA), which allows the United States to launch satellites from the Alcântara Launch Center in Maranhão state, a long-time desire of the U.S. military. 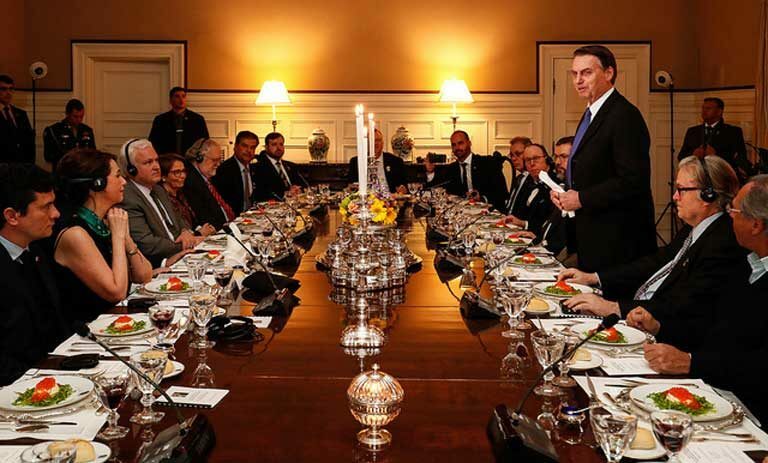 Bolsonaro stands during dinner with Brazilian ministers and Eduardo Bolsonaro in Washington. Former Trump strategist Steve Bannon is seated on right wearing translation headphones. Image by Alan Santos / Presidency of the Republic. 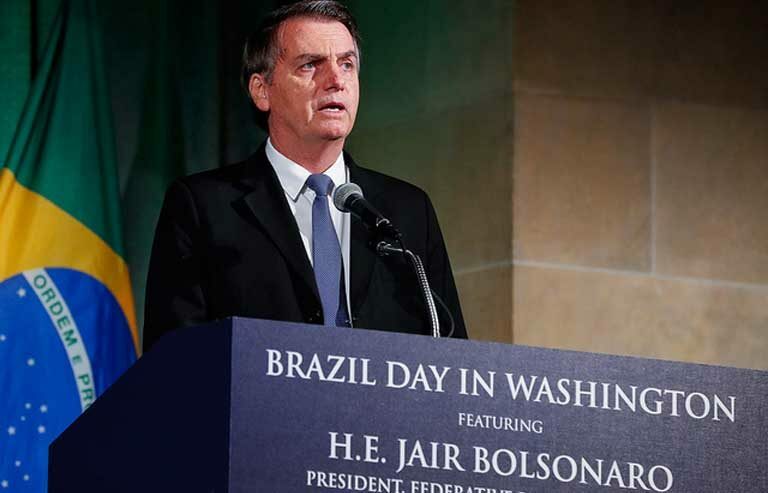 At a dinner held at the residence of the Brazilian ambassador in Washington, Bolsonaro stated that his government’s primary purpose is not to build things for the Brazilian people, but to deconstruct. “To undo a lot of things. Then we’ll start doing [something for the country].” Though this statement is vague on particulars, it could refer to Bolsonaro’s desire for environmental deregulation, which he views as too restrictive on business. Among the dinner guests was Steve Bannon, former strategist for President Trump — and a man close to Eduardo Bolsonaro, son of the Brazilian president. There is speculation that Bannon’s social media expertise helped get Bolsonaro elected. Bannon spoke of the need to reduce Brazil’s “co-dependence” on China and to manage the relationship with Beijing in order to protect Brazilian interests. It is expected that Brazil’s soy industry will continue to benefit from trade tensions between the U.S. (a major soy exporter) and China (a major soy importer). Interestingly, Agriculture Minister Tereza Cristina, who was also in Washington D.C., emphasized the importance of Brazilian agricultural exports to the Asian country, which is responsible for about 35 percent of the international sales of Brazil’s agricultural products. She will travel to China in early May to try to increase the number of buyers for Brazilian meat in that country. Pasturelands are the biggest driver of deforestation in Brazil. 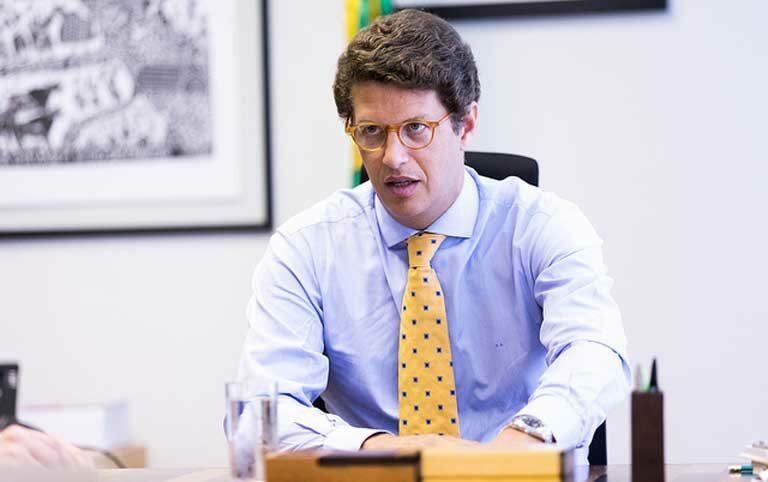 Ricardo Salles, Brazilian Minister of the Environment. Image by Gilberto Soares/MMA. During the 4th Session of the United Nations Environmental Assembly (UNEA) in Nairobi, Kenya, whose theme was “Innovative Solutions for Environmental Challenges and Sustainable Production and Consumption,” Brazilian Environment Minister Ricardo Salles declared that “the UN Environment Program, and the UN member states, must make a greater effort to face… extreme events created by man or by nature.” Then Salles defended industrial agribusiness. “Brazil does not agree with the alarming tone used to criticize the agricultural production of developing countries,” he said. Salles noted that “Brazil is particularly honored” to receive US$96 million from the Green Climate Fund (GCF), an investment fund established within the framework of the UNFCCC (United Nations Framework Convention on Climate Change), for reducing greenhouse gas emissions from deforestation. The minister mentioned that Brazil’s carbon emissions have fallen by about 72 percent since 2004, but did not say that this decline stopped in 2012; since then Amazon deforestation has increased annually. According to the environment minister, US$100 million will be made available for such projects via the Amazon Impact Investment Partnership, with low interest rates. 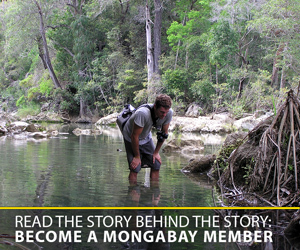 In fact, this sort of initiative isn’t new, but has existed for a number of years. Last August, Brazil’s environment ministry signed an agreement with the U.S. for a technical cooperation program intensifying action to conserve Amazonian biological resources, investing up to US$80 million over the next five years. Also last week, Salles ruled that IBAMA, the government’s environmental agency, and ICMBio, which manages the country’s federal Conservation Units, can no longer speak directly with the press. Instead, both governmental bodies must now submit all media requests to the Ministry of Environment. Banner image: President Jair Bolsonaro delivers a Brazilian soccer shirt to president Donald Trump in the Oval Office. Photo Isac Nóbrega / Presidency of the Republic.